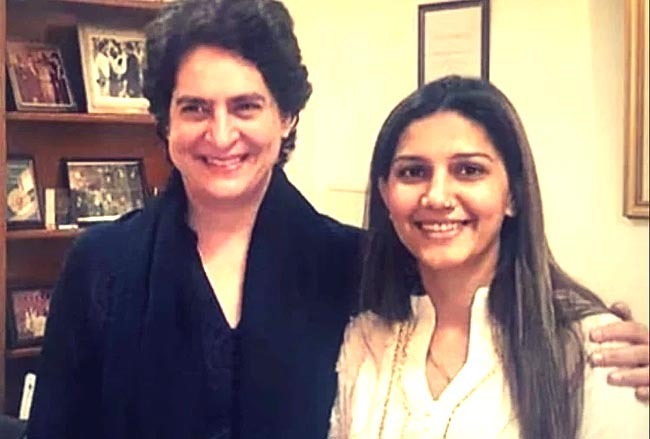 New Delhi, March 24 : Haryanvi artiste and popular stage performer Sapna Choudhary on Sunday denied joining the Congress and said her photograph with Priyanka Gandhi Vadra, that went viral on social media, was an old one. "I have not joined the Congress party. The photograph with Priyanka Gandhi is an old one. I have met her several times before. I am not going to campaign for any political party," she told reporters here. About her political ambitions, she said she was not joining politics. "When I will join politics, I will come out in the open," she said. Uttar Pradesh Congress chief Raj Babbar had on Saturday night tweeted a photograph of Choudhary along with Priyanka Gandhi, saying "welcome to the Congress family". Another photograph also surfaced in which Choudhary is seen signing some papers. Asked about it, she said: "I cannot tell what kind of paper was that," and added that as an artiste, she keeps meeting with various people. Choudhary's statement has put to rest speculations that she may contest the Lok Sabha elections from Mathura seat against veteran actor Hema Malini of the Bharatiya Janata Party (BJP).